Cloudian is integrating its platform with Citrix's CloudPortal Business Manager as it aims to make it easier to roll out and manage storage as a service. CloudPortal Business Manager is a services delivery platform that lets enterprises and service providers control user management, provisioning and other operational aspects of a cloud from a single interface. This is functionality Cloudian will take advantage of, according to Jay Desai, vice president of product management at Cloudian, whose platform is used to provide storage for private, public and hybrid clouds. To make the integration possible, Cloudian has developed a connector, aptly named Cloudian Connector for Citrix CloudPortal Business Manager. It works as a bridge between Cloudian's own application programming interface and the API Citrix has created for third parties that want to integrate with CloudPortal. Features such as service provisioning, multitenant user management, flexible pricing and billing are all available out of the box. IT staff can create a customized catalog of storage offerings with different amounts of storage and quality of service levels. Authorized users can then provision and consume storage on-demand. "We feel it is a comprehensive set of storage capabilities that lets service providers offer storage-as-a-service to their clients and enables enterprises to offer self-service storage, which frees up IT from a lot of tasks," Desai said. The combination will be especially useful for enterprises that want to build a private cloud, because unlike service providers they usually don't have the resources to create a similar solution in-house, according to Desai. The two companies aren't new acquaintances. Cloudian has integrated its product with Citrix's CloudStack-based CloudPlatform, which in turn can power CloudPortal. The connector will become available at the end of the month. 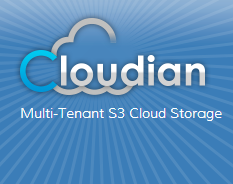 Cloudian didn't provide any details on what the integrated solution will cost.